Does pinball count? Arcade games were fine and dandy - I have fond memories of spending hours in front of the original Gauntlet multi-player and also Samurai Shodown (yeah, I think they really spelled it Shodown)... but I loved pinball the best. 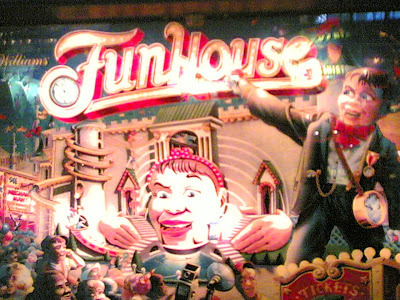 Jen and I visited Santa Cruz boardwalk last weekend and I found my all-time favorite pinball game - Funhouse. I took a picture for old times sake. They had one of these at the local Chuck E. Cheese's where I grew up. There was a big, creepy animatronic head that would taunt you. I loved it.